I feel patients should be treated as if they are family. With that in mind, I strive to create an atmosphere where patients can feel comfortable and know their concerns are heard. This takes time and I priide myself in being able to accomodate my patients accordingly. Excellence in dentistry begins with a careful co-diagnosis and treatment plan to establish the goals we will achieve together. Communication and long-term relationships are important to me. Let me know what is on your mind and feel free to ask questions. I beleive an investment in yourself pays dividends for a lifetime. I am fortunate to have a team of caring, skilled professionals, dedicated to simplifying what is often a very complicated and confusing area of health care. I have called Southern California home since 1971. I lived and attended school in Riverside, graduating from La Sierra Academy. 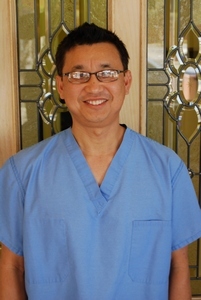 In 2004, I purchased my dental practice in Palm Springs and have been happily caring for patients ever since. In my free time I enjoy golfing and spending time with my wife and three children.